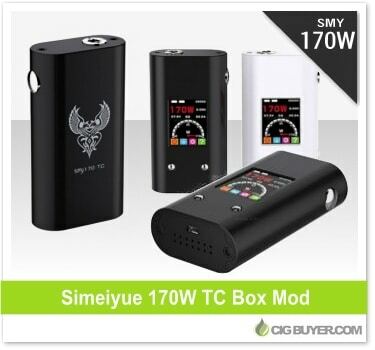 Known for the large color display screens that adorn their devices, the SMY 170 Box Mod is the latest and most powerful device from Simeiyue. Powered by dual 18650 batteries, it’s not nearly as compact as the SMY Mini 60W that we posted last week, but it packs up to 170W of power with a temperature control range from 200°F to 600°F. It fires down to 0.05 ohms and features magnetic battery cover, spring-loaded 510, micro-USB charging port and large color screen to display date, time and a wide range of vaping data.